It’s that time of year again when I’m getting applications via UCAS for the BA Multi-Platform Journalism course. I read through each one carefully and check how many points the applicant says they hope to achieve. Everyone is invited in for interview as I do believe in meeting people and finding out more about them, than just reading a piece of paper. I also think it’s good for them to meet staff and see the place and explore it. I wrote a blog last year on this, giving some tips for when invited to interview. It’s surprising how many students don’t get an interview but are just offered conditional without being seen, which brings me to another blog I wrote on test drives. If you can go visit the institution and get a feel for it. If taster sessions are offered, take them up and if you get offered media work experience take it! And then there’s the question of UCAS points – another blog where I commented on the points offered on my course and the reason behind it. It currently stands at 180, but from Sept 2011 will move to 240. The reason being I need to attract students who can write and speak English to a high standard; are well-read and can communicate their thoughts and opinions; plus here at ECM, we are unique in offering a chance to work at the Grimsby Telegraph one day a week and we have access to Seven, the local television station broadcasting on VirginMedia 879 (I’ll write a blog about that soon). Plus a large proportion of our journalism graduates work at the BBC, Sky as well as in other media outlets. Oh and we are a Skillset Media Academy! So because it’s Grimsby and you may think it’s the end of the universe – it isn’t. It’s actually very nice here and cost of living is cheap compared to elsewhere. If you have a car you can travel to Hull or Lincoln for a night out, if you don’t fancy Grimsby or Cleethorpes. So if you want to know more about the BA (Hons) Multi-Platform Journalism course then call 01472 315550 or contact me through this blog or on Twitter @eastcoastmedia and of course to learn more about me and my ability see my youtube channel or visit my podcasts. I think you’ll find I practice what I preach and the last word can go to one of our recent industry speakers, Lee Smallwood, read what he had to say about East Coast Media in his blog. I had an opportunity recently to go on a test drive. To put you in the picture, the snow and chaos surrounding it in December, made me revisit my aspiration of having a 4×4. One, I need one, having two dogs and a horse. The bad weather proved I did, as anyone owning a horse knows you have to be there day and night, no matter what the weather and my car just wasn’t up to driving through inches of snow. So through the power of Twitter, after having made a few comments about snow driving and being pulled out of snow drifts by tractors, @jamesbt_uk made contact. He’s the Centre Principal of Listers Toyota (Lincoln) and a lovely chap. He offered me the chance to come drive a Rav 4 and see what I thought of it. The other vehicle I’d considered was the Landrover Freelander, but I had heard too many negative comments about them, which put me off. Sorry Landrover – though I do hear the recent models are not so problematic! After a few phone calls, I found myself over the Christmas period in Lincoln. I have to say I was nervous. The vehicle was an automatic and I’d not driven one of those for ten years and it was a very expensive vehicle. I’m not used to driving prestige cars that cost around £26,000! I had nothing to fear. The team were fantastic, in particular Charlie, who answered my questions and showed me round the vehicle, before it was my turn. I had this vehicle for the day and what a treat! 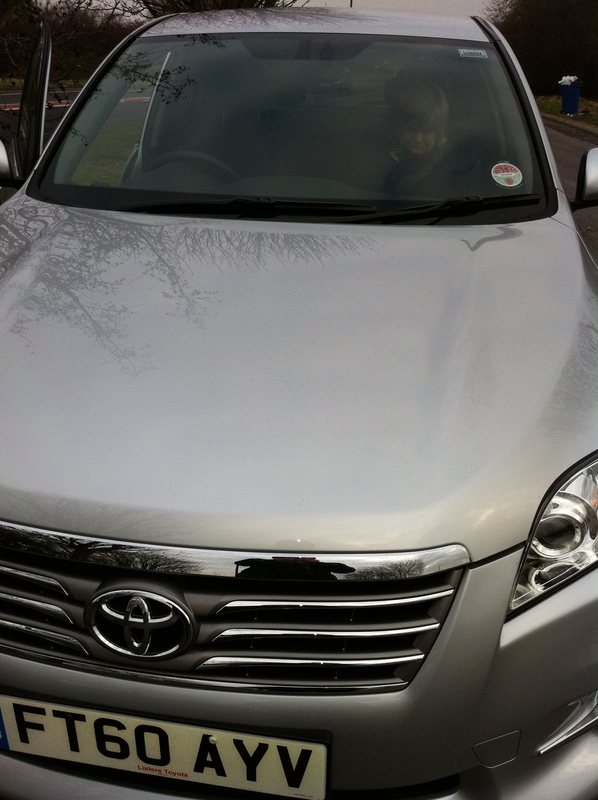 I have to say it handled beautifully in the city and in the countryside and was a very quiet, comfortable ride. I was bowled over by it. If I were a motoring journalist I’d be talking about its horse power and how it rolls or whatever. I can tell you I loved the back seats, which moved. So if you had a leggy back passenger or needed more room in the boot it was ideal. Also you had 80 litres of additional stowage under the boot carpet/floor and at a flick of a button, the back seats folded flat. Very handy as I hate having to climb into the back of the car and remove headrests and fiddle about lowering rear seats. In the front there was a nifty glove box, which also acted as a cool box – handy for your lipstick! I don’t like lipstick when it melts. One thing I forgot to mention is its intelligent all wheel drive, which I believe means that it detects what surface you’re on and shifts accordingly into four wheel or “normal” drive. Oh and it had headlights and wipers, which came on automatically and had many other cool features, including heated front seats, which impressed my passenger. I have to say it is on my wish list – not a new one, but definitely a second-hand one. Now you’re probably wondering what has test driving a Rav 4 got to do with East Coast Media and journalism? It’s all to do with that word “test drive”. Before signing up for any degree course, you need to get a feel for what it is you’re going into and signing up for. Ensure that the degree is what you want to do. Do you really want to be a journalist? Where do you see yourself in five years time? Who do you aspire to work for? Talk to tutors, meet current students and if the institution has an open day, go visit and look round. Do you envisage yourself living there for three years? Do you like the place? Do the staff have industry experience? What type of equipment will you be expected to use? Do you get your hands on the equipment? Some places, students don’t actually get to use equipment or very rarely see it. Ask questions, as many as you can. Find out about the course and what they offer to deliver. If there is a chance to do a “test drive”, ie go on a taster day, then do it. Unless you try, you’ll never know whether it is for you. You don’t want to end up making an expensive mistake and regretting the choice you made later. So look out for taster days at East Coast Media. I’ve been going into schools and working with A level students on multi-platform journalism “test drives”. I’ll blog about these, so you can see the type of things we do. PPS. I added some extra detail about the vehicle, for those that might, by chance, think this is a motoring blog! It’s that time of year when many youngsters will be awaiting their grades. Will it be enough to get them on to the course of their choice? If not, what will happen and what can they can do about it? If you haven’t achieved the grades to match the UCAS points for the course, there are various options you can take, so don’t feel it’s the end of the world (I know easy enough for me to say!). UCAS clearing (http://www.hotcourses.com/clearing-2010/clearing-houses-clearing-help/16180339/news.html) is where you need to go. For those unable to get on their first choice, then clearing offers places on courses who have vacancies. According to the news release (see link above) there are around 35,000 people every year who go through this system. There is hope for those. Getting on your first choice is competitive, but if it doesn’t happen, know you still have a chance of getting a place. So once you get to clearing you’ll need to know make a decision about what course you’d like to apply for and where in the country you want to go. If it’s journalism then look no further than East Coast Media. Based at the Grimsby Institute, we are one of 22 Skillset Media Academies in the UK. This is a badge of excellence. From September 2010 the BA (Hons) Multi-Platform Journalism degree will run. This is exciting, as there are very few programmes in the UK offering this. It has been written with assistance from industry to deliver graduates with the right skills and training. The world of journalism has changed. Journalists are now expected to take photos, shoot and edit video, create audio packages – not only for traditional platforms but for online. This is bi-media, tri-media, whatever you want to label it and if you want to get a break into journalism, then you need to embrace this now. At East Coast Media you will get the skills and knowledge to develop. There’ll be opportunities for work placements within the broadcast and newspaper industry. You’ll work alongside industry professionals and create real work for publication/broadcast as opposed to simulations. You’ll be encouraged to be creative and have ideas for 360 degree platforms. Recent students have worked on pilot television programmes with East Coast Pictures, an independent production company led by Julia Thompson, former Director of Sony Entertainment UK. Those students also had to produce content for online and act as researchers, reporters, etc. It gave them real experience of working on a TV programme. Tutors on the course are all industry practitioners, so you’re in good hands there and the course has excellent work placement relations with some big companies. You can expect your tutor to get to know you personally, rather than being a face among hundreds. This means that you do get one to one assistance and probably feel more valued. So if it’s a career in journalism you wish to pursue and you’re passionate about it and motivated to do what you can to go far, then come to East Coast Media. We will want to talk to you to find out why you want to the course and find out if you have the passion and motivation needed. Remember, ask us questions too. We will interview you and you’ll also have to sit an assessment test on the day and there is a written task to do as well. This thorough application process is to ensure you’re suited for the programme – we don’t just give places out to anyone. We need to know that you are right for the course, as much as we’re right for you. It’s all about quality on both parts. If you know someone who is in this position and wants to do journalism then tell them about this blog. Follow @eastcoastmedia on Twitter. Maybe we’ll see you soon! East Coast Media – shameless self promotion! Well it has to be done! I might as well use my talents as a journalist to promote my own course. Currently the course at East Coast Media is BA (Hons) Journalism, validated by University of Hull. It predominately is print based, but due to moves in industry to go towards a more multi-media journalist, the course has been rewritten and will hopefully resurface as BA (Hons) Multi-Platform Journalism. I am currently waiting for the programme to go before the university board to validate it. Fingers crossed for June 24th. Then if approved it will run from September 2010. The new programme has been developed to produce an all-round journalist; one who can produce copy for print; produce video content for TV and online as well as audio. It will introduce them to concepts of social media and how to use it effectively as a journalist. How to source stories and engage with the audience. The BBC and the local newspaper, the Grimsby Telegraph, have been asked for advice and read over the content. The Broadcast Journalism Training Council (BJTC) has also been instrumental in giving advice and support as to where we need to progress. It is an exciting time and in preparation for September I have been hitting the social media networks big time. Though youngsters seem to use social media, they probably do not use them for the right reasons – networking, gaining contacts and information, searching for jobs, etc. The programme will deliver the basic content in teaching undergraduates how to write for different mediums; how to use equipment to a standard; how to produce online material; how to operate as a multi-platform journalist, etc. It is a big undertaking, but one which the team are ready for. If anyone is interested in the course then they need to apply through UCAS, as we are now recruiting for Sept 2010. We have a very rigorous assessment procedure, which includes an interview and written assessment – grammatical errors test and press release rewrite. Mature applicants are also considered. A big must for the course is that the candidate shows how passionate and enthusiastic they are to be a journalist – not many show this at all! They also need to be interested in news and current affairs – watch the news, not just local but national. Why do you watch it? What makes one news programme more engaging than another? What newspapers do you read? Why? It’s amazing when asked these staple questions, many let themselves down. They only read the local paper because it’s in the house; they watch the local news because it’s already on when they get home. It does not show me your passion for wanting to break into the industry. Maybe I’m really tough and harsh. But, if these processes are not gone through, the ones that don’t show that passion soon drop out. It has taken me a year to put this course together and consider what future journalists need to know. It is also based on a report published in 2008 by the National Council for the Training of Journalists (NCTJ). Just speak to any of our graduates to find out firsthand what they thought of the course – the new one will be much improved. Contact 01472 315550 if you require further information. But don’t dismiss East Coast Media (which happens to be a Skillset Media Academy) and Grimsby as being the end of the universe: there is more than meets the eye in this corner of the world.